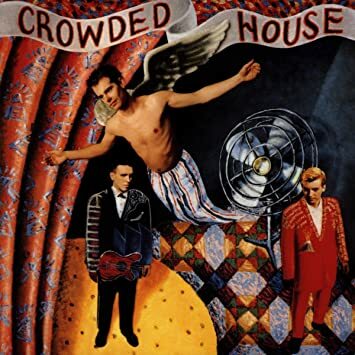 Crowded House – let me ask you…do you believe in love at first sight? Because this was a case of exactly that. Or not really. Because Crowded House grew out of Split Enz (see S) who were one of my favourite bands in the late Seventies. Neil Finn had joined his big brother Tim’s band and wrote their biggest hits. But along came the Eighties and the band struggled and eventually Tim went to Hollywood to be a solo star (see F). Neil joined forces with Guitarist Nick Seymour and Drummer Paul Hester, who sadly killed himself after album number 3. They were instantly famous and had over a decade of success before splitting only to reform over a decade later. But it was the first 11 years and four great albums that were by far the best. In fact their debut Crowded House was possibly their finest; it simply brims over with enthusiasm and joie de vivre, rare indeed in 1986. There isn’t a weak track on it, in fact they never recorded any weak tracks at all. From opener ‘Mean To Me’ to riotous closer ‘That’s What I Call Love’ they just sound wonderful. Everyone’s favourite is ‘(hey Now) Don’t Dream it’s Over’, which has become a staple of radio-play and has been recorded by many. This album too is short, just 39 minutes long, in an era of 70 minute dole-fulls of boredom. I managed to see them quite a few times and it was always a joyful sing-along. Two years late and Temple Of Low Men came out. Another good record, though it sold less well (the title incidentally being a reference to the place men tend to worship at). The album itself seems a bit more introspective, less ecstatic – but with great songs nevertheless; ‘Into Temptation’, ‘Sister madly’ and ‘Better Be Home Soon’ are probably my very favourites. Three years later and Neil Finn, the songwriter, wasn’t too happy with his next batch of Crowded House songs. He had recorded an album with brother Tim called Finn (see F) and invited Tim to help him write some new songs. The collaboration was so good that Tim temporarily joined the band for the album Woodface and subsequent tour. This was their most successful record and for a couple of years the band were on top of the world and could do no wrong. And the album is a joy, from the opener ‘Chocolate Cake’ to closer ‘How Will You Go’ it is splendid – so many great songs – most famously ‘Weather With You’, ‘Four Seasons In One Day’ and ‘Italian Plastic’. And then – disaster struck, just after recording their follow-up, the drummer Paul Hester left the band, depressed he later killed himself. Writing in 2010 Neil Finn said, “When we lost Paul it was like someone pulled the rug out from underneath everything, a terrible jolt out of the dark blue. He was the best drummer I had ever played with and for many years, my closest friend.” The band carried on and recruited a new drummer and keyboardist Mark Hart, who had helped in recording Together Alone (1993). Tim had by now moved on but the album was another triumph. Best songs – ‘Private Universe’, ‘Distant Sun’ and ‘Catherine Wheels’ – but really hard to make a choice form such a great selection. And that was that really – at least for a few years. A few weeks after Together Alone came out and I saw them at The Fleadh in Finsbury Park with my daughter Lydia. I later saw and couldn’t resist buying the bootleg CD of the concert – one of their best, and listening now to the exuberance of the crowd and I am saddened by memories and hearing Tim Finn slightly ridiculing drummer Paul Hester for leaving the band at the last minute. He was to commit suicide a few years later. The band officially broke up in 1996. But, as so often happens, they reassembled with a new drummer. The tracks that Neil had recorded for a third solo album with old partner Nick Seymour (and four new ones) were released under the Crowded House name as Time On Earth. Well, of course I haven’t listened to this half or even a quarter as much as their earlier albums – but somehow the songs seem to wash over me without settling anywhere near my brain. I am sure they are perfectly good, but somehow all the excitement has gone. There is a momentum when a band is young, a vibrancy, an excitement – but when they are well-established and making the occasional album and tour, they may still be great live but somehow it is just treading water. Anyway, just one other album so far – 2009’s Intriguer. I am not even sure if the band is still together as Neil occasionally knocks out a solo album and they don’t appear to be touring now. The album itself is very quiet, in fact it is really a Neil Finn solo album with the members of Crowded House playing in the background. A lovely record and it is growing on me slowly; best songs ‘Elephant’ and ‘Twice If You’re Lucky’. For a while there Crowded House were my favourite band; in fact they are probably the last of my favourite bands as none this century have grabbed my attention that much.